Keeping you up to date with Velez Malaga news and events. 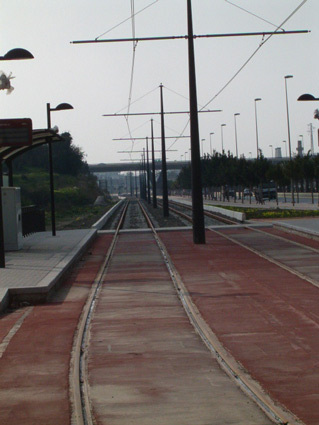 Confusion surrounded the announcement this week by the mayor of Velez Malaga Antonio Souviron that the 'tranvía' tram link would start running by the first week of March. Shortly after the mayor's comments CAF the company responsible for constructing the new line stated that the tram service will indeed start very soon... sometime in April. For the residents of both Velez-Malaga & Torre del Mar who have been waiting since 2004 for the proposed 'tranvía' tram service to start operating this is just another chapter in the on-going saga. The service, which will connect Velez Malaga with its costal neighbour on a route that will also serve the local hospital, was originally planned to start operating in the summer of 2005 and at first things seemed to be going well as a number of the early stages of the construction process finished ahead of schedule. But the summer deadline came and went and although it was never officially stated, many people believed that the reason for this was that the Ayuntamiento ran out of budget and so were not able to pay for the rolling stock required to run the service in the 2005 financial year. Despite this an announcement was then made in the autumn by the Ayuntamiento confirming that the first tram would definitely be in service before the year was out. Sure enough the ensuing months saw an increase in the activity to get the final stages of the construction of the tram line completed, including the installation of the electric power lines. Then just before the New Year deadline an unveiling ceremony took place at the new tram depot built opposite the El Ingenio shopping centre. A group of local town hall dignitaries and representatives of CAF the construction company accompanied by a brass band, applauded as the long awaited tram draped in the Andalucian flag was unveiled . Locally people started to believe that maybe they would be able to use the service to get to their New Years Eve parties but alas after the ceremony the shiny new tram was returned to its shed, where it has remained to this day. Since then there have been further problems the latest delay has been caused by a problem with the electricity supply from the newly built sub-station which came to light during recent testing. Endesa Sevillana, the local electricity supplier, has said the problems found can be quickly resolved and so everyone is now waiting to see if will be March or April before they can start using the tram. For more information on the Velez-Malaga town please see our Guide to Velez Malaga page.